We’ve always had a soft-spots in our hearts for the midsize sedan. It’s just such a solid type of vehicle, fully embodying what we see in our minds when we say the word, “car.” And every year, automakers’ entries in this class just get more and more exciting. The Volkswagen Passat was already a sleek machine, and for 2019 it’s become even sleeker. Changes by Volkswagen include streamlining the Passat to just two trims, and adding a slew of standard driver-assistance features. With a starting MSRP of just $25,295, the 2019 Volkswagen Passat is hard to beat. The 2019 Honda Accord, however, is going to give it a try. Let’s see how these two midsize sedans stack up in our head-to-head model comparison. The 2019 Volkswagen Passat brings a feeling of sleek luxury that still manages to feel effortless and unforced. Though only coming in two trims, the Wolfsburg and SE R-Line, both are refined and high-end. The base model Wolfsburg trim already comes with leather materials on the steering wheel and gear shift, and a leatherette seat trim. Premium touches such as an analog clock, carpeted floor mats all around, heated front seats, and an available sunroof round out the upper-level feel. The cabin of the 2019 Passat is also loaded with modern technology and amenities. These include three power outlets, KESSY USB ports, satellite radio, voice recognition, two front LCD screens, a proximity key and available remote starting system. And that’s not even getting into the features of the SE R-Line trim. 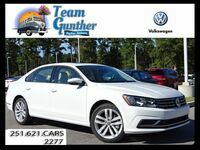 The 2019 Volkswagen Passat impresses on all fronts with its quiet, comfortable ride, expansive cargo room, generous passenger space, and seemingly never-ending warranty. The engine provides a responsive ride with 174 horsepower, but doesn’t sacrifice fuel economy, getting a clean 29 combined miles-per-gallon. Precise steering keeps things on track. Meanwhile, the gratuitously large trunk provides nearly 16 cubic feet of space. Best Limited Warranty in the U.S.A. Finally, the 2019 Volkswagen Passat outshines the 2019 Honda Accord with "The People First Warranty” from Volkswagen. Doubling the offer from Honda, the coverage provided by Volkswagen really is America’s best limited warranty.